Happy April Fools' Day! 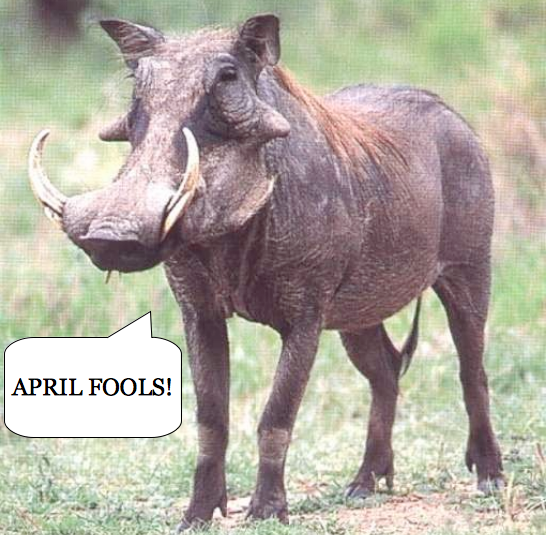 Okay, so there's no special warthog contest -- but here's a recipe we like! 2. Remove from heat, and rest at least 15 minutes. Spread a mound of mascarpone on each serving plate, top with 6 prunes and drizzle with syrup. Serve immediately. First, you absolutely had me on this one. But I confess I was also wondering if Pierino had hacked into your computer :-). Second, I have no idea what warthog actually tastes like but the recipe above, sans the mascarpone, actually sounds like a great sauce for warthog. With the mascarpone, sounds like a great dessert. Why does everybody automatically blame this stuff on me??? Wart + Hog = Hilarious. How funny! As I clicked in I was thinking...thinking...of places to buy warthog and was going to ask if it could be ordered online. Ha! OMG, I totally fell for it. I even said outloud, "Where in the world does one buy warthog?" I also have a recipe for stuffed lentils in the same vein. The stuffed lentils took us a second, but now we're literally crying with laughter. Anyone know where I can pick up some muffler bearings? Firestone doesn't carry them anymore. Hedonia and the Hungry Hipster is very funny...it had me going until the bacon... Happy April Fools Day!!!!! OK, I am SO gullible...You got me, guys, just as I was going to dig up my bow and arrow. I love it! Happy April Fools day! OH DARN!!! I have a great recipe from "The Explorers Cookbook" credited to Robert M. Lee who started a Manhattan shop called Hunting World (early 60s). It begins with "Armed with proper license as well as your favorite rifle, shoot a warthog, preferably a fairly young one and never a big old trophy boar." Sounds delish!!!! I would think that is probably one cool cookbook. I was looking forward to seeing what pierino would come up with. Happy April Fool's Day! Pierino was working on it but A&M beat me to it. I was thinking along the lines of the things you look for in China Town; "it makes you strong!" Aw, shoot! I was hoping to grace the Easter table with a nice leg of warthog, too. Let's cook a razorback! Might be a bit chewy though. I was going to ask if it is OK to substitute Whistle Pig.